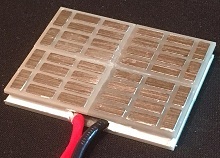 PbTe/TAGS single crystal thermoelectric power modules are a new class of extreme high efficiency TEG module offering superior efficiency (up to 12%) in a small package. The PBTAGS-200.004A (4 couple) and PBTAGS-200.009A (9 couple) offer high efficiency power delivery in the 400°C to 600°C temperature range. The TEG modules we offer presently are potted (sealed) for up to 20 years of operational life. Teflon lead wires mounted on the cold side for thermal protection, AIN ceramic plates with graphite thermal pads.